ANTWERP, Jordan – Exactly 15 years ago, the EFICO Foundation was launched. The Foundation illustrates the EFICO Group’s commitment to sustainable development. Established as a private foundation, the EFICO Foundation’s goal is to positively impact coffee farmers’ livelihoods, prosperity and environment. The multi-stakeholder approach adopted is unique and is a dynamic tool to foster partnerships and innovation in the coffee supply chain, multiplying impact. The EFICO Foundation is about people – from coffee farmers, their families and local communities to coffee consumers purchasing a sustainable product. To continue making a difference by supporting multi-stakeholder projects in coffee producing countries with the aim to improve hereby the livelihoods of many. The Foundation also aims to continue being a catalyst, federating partnerships in the sector. For 2018-2020, focus areas are knowledge transfer, sustainable income increase for farmers, and adaptation and mitigation to climate change. 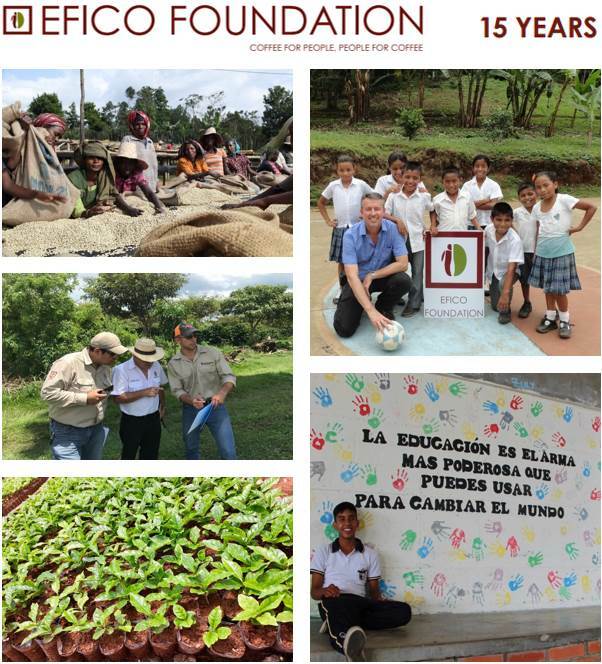 “We are happy and proud to look back on the positive impact of 70 projects in 17 producing countries on the daily lives of the coffee families” says the Foundation in a press release. “With the current low coffee prices, it now is more than ever important to support coffee farmers in the many challenges they face.